More than a decade ago, Franklin & Marshall College reimagined the business major and created a new one: business, organizations and society (BOS). From March 16 to 18, academic leaders from around the country will gather on campus for a workshop on blending liberal arts and business curriculums. 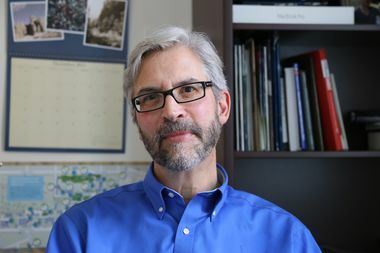 “It's exciting to bring together top liberal arts colleges and others to explore the distinctive ways that the liberal arts can transform the study of business and thus the future practice of business,” said F&M Professor of Legal Studies Jeffrey Nesteruk, leader of a three-year project to bring liberal arts content, skills and pedagogies to the study of business. The workshop, “Collaborating for the Common Good: Reimagining Conversations between Business and the Liberal Arts,” is the latest aspect of the project, funded by a $280,000 grant from the Teagle Foundation that F&M shares with Bucknell University and the University of Pennsylvania. It’s largely how institutions have long organized disciplines, in addition to an institutional desire to hold on to tradition, that makes merging liberal arts and business a tough task, Preisser said. When F&M successfully integrated business and humanities to create the BOS major, it piqued the interest of the Aspen Institute, Teagle Foundation and Carnegie Foundation, institutions that believe BOS should serve as a model for all institutions. Attending the two-day workshop are business and liberal arts professors from F&M, Bucknell, University of Pennsylvania, Augsburg College, College of the Holy Cross, Gettysburg College, Loyola University Maryland, Mt. Holyoke College, Trinity College, University of Richmond, Utah State University and Washington & Lee University. F&M President Daniel R. Porterfield will make lunchtime remarks on March 16.